Twenty-nine patients with ischaemic heart disease plus either glucose intolerance or type 2 diabetes were randomised to receive (1) a Palaeolithic (‘Old Stone Age’) diet (n = 14), based on lean meat, fish, fruits, vegetables, root vegetables, eggs and nuts; or (2) a Consensus (Mediterranean-like) diet (n = 15), based on whole grains, low-fat dairy products, vegetables, fruits, fish, oils and margarines. Primary outcome variables were changes in weight, waist circumference and plasma glucose AUC (AUC Glucose0–120) and plasma insulin AUC (AUC Insulin0–120) in OGTTs. Over 12 weeks, there was a 26% decrease of AUC Glucose0–120 (p = 0.0001) in the Palaeolithic group and a 7% decrease (p = 0.08) in the Consensus group. The larger (p = 0.001) improvement in the Palaeolithic group was independent (p = 0.0008) of change in waist circumference (−5.6 cm in the Palaeolithic group, −2.9 cm in the Consensus group; p = 0.03). In the study population as a whole, there was no relationship between change in AUC Glucose0–120 and changes in weight (r = −0.06, p = 0.9) or waist circumference (r = 0.01, p = 1.0). There was a tendency for a larger decrease of AUC Insulin0–120 in the Palaeolithic group, but because of the strong association between change in AUC Insulin0–120 and change in waist circumference (r = 0.64, p = 0.0003), this did not remain after multivariate analysis. The online version of this article (doi: 10.1007/s00125-007-0716-y) contains supplementary material, which is available to authorised users. Impaired glucose tolerance (IGT) and type 2 diabetes are common risk factors for ischaemic heart disease (IHD) [1, 2], which negatively affect the long-term prognosis after myocardial infarction [3, 4]. In fact, cross-sectional studies have found only 35–54% of IHD patients have normal glucose tolerance (NGT) [5, 6, 7, 8, 9, 10, 11]. Increased physical activity, healthy food choices and decreased waist circumference may help to lower the rate of progression from IGT to diabetes [12, 13, 14]. Standard dietary advice for patients with IHD and/or IGT generally includes whole-grain cereals, low-fat dairy products, vegetables, fruits, legumes, oily fish and refined fats that are rich in monounsaturated fatty acids and alpha-linolenic acid while low in trans-unsaturated fatty acids [15, 16, 17]. However, the optimal dietary treatment of IGT and insulin resistance is a matter of debate, including the preferred amounts and types of fat, carbohydrate and protein [16, 18, 19, 20, 21], and amounts of fruits  and sodium [23, 24]. Since nutritional science is hampered by confounders, an evolutionary approach has been suggested. It is postulated that foods that were regularly eaten during primate and human evolution, in particular during the Palaeolithic (the ‘Old Stone Age,’ 2.5–0.01 million years BP), may be optimal to prevent insulin resistance and glucose intolerance [25, 26]. A Palaeolithic diet includes lean meat, fish, shellfish, fruits, vegetables, roots, eggs and nuts, but not grains, dairy products, salt or refined fats and sugar, which became staple foods long after the appearance of fully modern humans. We found that traditional Pacific Islanders of Kitava, Papua New Guinea, had no signs of IHD, stroke or markers of the metabolic syndrome, possibly because of their traditional lifestyle [27, 28, 29]. In the present study, we examined the effect of dietary advice according to this Palaeolithic diet model on glucose tolerance and post-challenge insulin response in glucose-intolerant IHD patients recruited from a Coronary Care Unit, compared with dietary advice according to standard clinical practice. Our hypothesis was that the Palaeolithic diet would provide metabolic benefits beyond its nutrient composition. The study was a 12 week controlled dietary intervention trial in 29 (out of 38 eligible) male IHD patients with waist circumference >94 cm and increased blood glucose or known diabetes, recruited from the Coronary Care Unit at Lund University Hospital, Sweden. We included patients with any of the following conditions: an ongoing acute coronary syndrome, a history of myocardial infarction diagnosed by creatine kinase MB isoenzyme or troponin elevation, percutaneous coronary intervention or coronary artery bypass surgery or angiographically diagnosed coronary stenosis ≥30%. Exclusion criteria were BMI <20 kg/m2, serum creatinine >130 μmol/l, poor general condition, dementia, unwillingness/inability to prepare food at home, participation in another medical trial, chronic inflammatory bowel disease, type 1 diabetes and treatment with hypoglycaemic agents, warfarin or oral steroids. Other drugs were not restricted, and treatment with statins and beta blockers was usually initiated and/or changed during the trial. Approval for the study was obtained from the regional Medical Ethics Committee, and all individuals gave written informed consent to participate in the study. In addition to the 29 patients who completed the trial, nine randomised subjects were excluded for the following reasons: worsening general condition (n = 4), unwillingness to continue (n = 3, all in the Palaeolithic group) or missing OGTT data (one in each group). All eligible subjects were informed of the intention to compare two healthy diets and that it was unknown if either of them would be superior to the other with regard to weight reduction and improved glucose metabolism. Patients qualified for the study if they had known type 2 diabetes or, at a screening OGTT with 75 g glucose, a fasting capillary blood glucose ≥6.1 mmol/l or a 2 h capillary blood glucose ≥7.8 mmol/l. In 13 subjects, this screening OGTT was performed after an acute coronary episode (Table 1). The remaining 16 subjects, eight in each group, were recruited between 2 months and 2 years after hospital discharge. Blood glucose concentrations were analysed in capillary whole blood immediately after collection with a HemoCue photometer (HemoCue, Ängelholm, Sweden). A second OGTT was performed within 2 weeks, when venous plasma samples were collected <5 min before and 30 and 120 min after ingestion of 75 g of glucose and analysed for glucose by the glucose oxidase technique and for insulin by RIA (Linco Research, St Charles, MO, USA). Normal plasma glucose was defined as a fasting venous plasma glucose <6.1 mmol/l and a 2 h venous plasma glucose <7.8 mmol/l. IGT was defined as 2 h plasma glucose of 7.9–11.0 mmol/l and fasting plasma glucose <7 mmol/l, and diabetic levels as fasting plasma glucose ≥7.0 mmol/l or 2 h plasma glucose ≥11.1 mmol/l. Impaired fasting glucose (IFG) was defined as a fasting plasma glucose 6.1–6.9 mmol/l and a 2 h venous plasma glucose <7.8 mmol/l. Immediately after the second OGTT, subjects were randomised to one of two healthy diets: (1) a Consensus (Mediterranean-like) diet (n = 15) based on whole-grain cereals, low-fat dairy products, potatoes, legumes, vegetables, fruits, fatty fish and refined fats rich in monounsaturated fatty acids and alpha-linolenic acid; or (2) a Palaeolithic diet (n = 14) based on lean meat, fish, fruits, leafy and cruciferous vegetables, root vegetables (including restricted amounts of potatoes), eggs and nuts. All subjects were never-smokers or ex-smokers (Table 1), five of whom had stopped smoking ≤2 weeks prior to study start (three in the Palaeolithic group and two in the Consensus group). The others had stopped smoking >6 months ago. All subjects were informed individually (by S. Lindeberg, K. Sjöström or E. Borgstrand) during two 1 h sessions and were given written dietary advice and food recipes. Only subjects in the Consensus group were informed of the possible benefits of Mediterranean-like diets rich in whole grains and about the Lyon Diet Heart Study . The Consensus group was also educated by use of a dietary questionnaire for nutrition counselling (‘20 questions’)  used in a successful health promotion programme, ‘Live For Life,’ which led to lowered cardiovascular and total mortality in the Habo municipality, Sweden  (Supplementary Table 1). Only subjects in the Palaeolithic group were educated in the concept of evolutionary health promotion  and the potential benefits of a Palaeolithic diet. They were advised to increase their intake of lean meat, fish, fruits and vegetables and to avoid all kinds of dairy products, cereals (including rice), beans, sugar, bakery products, soft drinks and beer. The following items were accepted in limited amounts for the Palaeolithic group: eggs (one or fewer per day), nuts (preferentially walnuts), potatoes (two or fewer medium-sized per day), rapeseed or olive oil (one or fewer tablespoons per day). The intake of other foods was not restricted and no advice was given with regard to proportions of food categories (e.g. animal vs plant foods). The type of dietary advice given to the Consensus group was similar to the established programme at the Coronary Care Unit. Since the required increase in education intensity in order to match the Palaeolithic group was rather small, no ‘usual care’ control group was considered necessary. Advice about regular physical activity was given equally to the two groups. Both groups were advised not to consume more than one glass of wine per day. Changes in the AUC between 0 and 120 min during OGTT for plasma glucose (AUC Glucose0–120) and plasma insulin (AUC Insulin0–120) were predefined primary endpoints, along with changes in body weight and waist circumference. The base of the AUC was set at 0 mmol/l for glucose and 0 pmol/l for insulin. The computer-generated homeostasis model assessment of insulin resistance (HOMA-IR) index, which has been suggested to provide a reasonable estimate of insulin resistance, was derived from fasting plasma glucose and insulin (www.dtu.ox.ac.uk) . The early phase of post-challenge glucose and insulin responses were represented by the AUCs (Incremental AUC Glucose0–30 and Incremental AUC Insulin0–30) during the first 30 min of the OGTT, using levels at 0 min as the base of the area. A 4 day weighed food record on four consecutive days, including one weekend day, with weighing of each food item on a digital weighing scale (that could be set to zero), was completed by the participants, starting 15 ± 5 days after initiating the dietary change. Nutrients were calculated using Matsedel dietary analysis software (Kost och Näringsdata AB, Bromma, Sweden). Glycaemic load was calculated by multiplying the content of available carbohydrate in the serving of each food by the food’s Glycaemic Index (with glucose as the reference) as given by Foster-Powell et al. . Under-reporting was checked for by comparing food records with baseline weight and achieved weight loss, and by evaluating distribution and amount of consumed food. Body composition was estimated in a subset of 15 patients by use of leg-to-leg bioelectrical impedance analysis (BIA), using a Tanita Body Fat Analyzer (Model TBF 105; Tanita Corporation of America, Arlington Heights, IL, USA). A pre-study power calculation showed that 12 subjects would be needed in each group in order to detect, with 80% power and at a significance level of 5%, a 20% reduction in AUC Glucose0–120. Group assignment was made by use of minimisation, a restricted randomisation procedure which lowers the risk of baseline differences , using diabetes at screening (no/yes) and BMI (below or above 27 kg/m2) as restricting variables. A two-way paired t test was used to analyse within-subject differences in absolute values, while a two-way unpaired t test and repeated-measures ANOVA were used to analyse between-subject differences in these changes. Simple and multiple linear regression was used to analyse univariate and bivariate relationships. All variables showed reasonable normal distribution in normal plots, but change in AUC Glucose0–120, HOMA-IR and fruit intake showed perfect normal distribution only after ln transformation. The two groups differed at baseline only with regard to age being higher (p = 0.01) and plasma triacylglycerols being lower (p = 0.06) in the Palaeolithic group (Table 1). There was no relationship between age and any of the outcome variables at study start (Supplementary Tables 2, 3, 4, 5 and 6). During the 12 week dietary intervention, both groups decreased their waist circumference with a greater decrease in the Palaeolithic group (p = 0.03; Table 2). Weight loss was on average 4.4 kg with no significant group difference. bAUC for glucose and insulin response to a 75 g OGTT. The base of the AUC was set at 0 mmol/l for glucose and 0 nmol/l for insulin. In the Palaeolithic group, there was a 20% decrease in the OGTT AUC Glucose0–120 during the first 6 weeks (p = 0.0001), and an 8% decrease between weeks 6 and 12 (p = 0.12; Figs 1 and 2, Table 2). In the Consensus group, a 10% decrease of AUC Glucose0–120 was seen after the first 6 weeks (p = 0.09) with no further change at 12 weeks (+4%, p = 0.4), despite a further decrease of weight (p = 0.0003) and waist circumference (p = 0.003). In the whole study population, there was no relationship between change in AUC Glucose0–120 and changes in weight (r = −0.06, p = 0.9) or waist circumference (r = 0.01, p = 1.0) during the whole study period (Supplementary Table 6), which, consequently, did not explain the larger improvement of AUC Glucose0–120 in the Palaeolithic group (Supplementary Table 2). In each group, AUC Insulin0–120, decreased during the first 6 weeks by 22%, but the decrease over 12 weeks was significant only in the Palaeolithic group (Table 2, Fig. 3). After adjustment for waist loss, the tendency for a larger decrease of AUC Insulin0–120 in the Palaeolithic group was no longer significant (Supplementary Table 3). Among the two groups combined, there was no association between change in AUC Glucose0–120 and change in AUC Insulin0–120 (r = 0.19, p = 0.3), and thus the group difference in improvement of AUC Glucose0–120 was independent of changes in AUC Insulin0–120 (p = 0.002) or ln HOMA-IR (p = 0.0009; Supplementary Table 2). Among secondary outcome variables, the most marked change was a 36% decrease in 2 h plasma glucose in the Palaeolithic group (from 8.9 to 5.6 mmol/l, p = 0.0003; Table 3). In contrast, 2 h plasma glucose decreased by only 7% in the Consensus group (p = 0.10), and the difference between the groups was highly significant. After 12 weeks, all 14 subjects in the Palaeolithic group had normal values, compared with 7 of 15 subjects in the Consensus group (p = 0.0007 for group difference; Table 4). At 12 weeks, five subjects in the Consensus group still had diabetic values. There was a decrease of HOMA-IR in both groups with no significant difference between the two groups (Table 4). The QUICKI index of insulin sensitivity [1/(ln fasting plasma insulin + ln fasting plasma glucose)] did not change more in the Palaeolithic group than in the Consensus group (p = 0.23, data not shown). The early phase of post-challenge glucose and insulin responses, as represented by Incremental AUC Glucose0–30 and Incremental AUC Insulin0–30, did not change significantly during the trial, although a trend towards lowered Incremental AUC Insulin0–30 was seen in both groups (Table 4). Reported food composition differed between the two groups such that subjects in the Palaeolithic group had a much lower intake of dairy products, cereals and oil/margarine, and a higher intake of fruits and nuts (Table 5). The intake of vegetables, meat, meat products or fish did not differ significantly between the groups. Total fat intake was low with no difference between the groups (Table 6). Absolute protein intake was identical in the two groups while relative protein intake (as a percentage of total energy intake [E%]) was higher in the Palaeolithic group. Absolute carbohydrate intake was 43% lower in the Palaeolithic group, and 23% lower in terms of E%. Glycaemic load was 47% lower in the Palaeolithic group and correlated strongly with cereal intake (r = 0.75, p < 0.0001). Energy intake was 25% lower in the Palaeolithic group (p = 0.004; Table 6) despite similar quantities of consumed food (by weight; Table 5). After adjustment for energy intake, the improvement of AUC Glucose0–120 was still larger in the Palaeolithic group (p = 0.02; Supplementary Table 2), while the larger waist loss, and the tendency for larger decrease of AUC Insulin0–120, compared with the Consensus group, disappeared (Supplementary Table 3). In post hoc analysis among the whole study population, a positive association between intake of cereals and change in waist circumference explained 42% of waist loss among the whole study population (p = 0.0003; Supplementary Table 6), and 40% in the Consensus group alone (p = 0.016). In contrast, there was a negative correlation between fruit intake and change in waist circumference, which explained 21% of waist loss (p = 0.01). Each of these associations remained significant after adjustment for dietary assignment, energy intake, carbohydrate intake or glycaemic load (Supplementary Table 5). Thus, waist loss increased with increasing intake of fruits and decreasing intake of cereals, associations which explained most of the group difference in waist loss. Compared with waist change, weight change was generally less clearly associated with dietary assignment and other variables (Table 2, Supplementary Tables 2, 3, 4, 5 and 6). Glycaemic load was positively associated with changes in waist (r = 0.52, p = 0.008) and AUC Glucose0–120 (r = 0.50, p = 0.01) but not with change in AUC Insulin0–120 (r = 0.30, p = 0.15). When glycaemic load and dietary assignment were entered simultaneously as explanatory variables in bivariate linear regression, neither of these was significantly associated with change in AUC Glucose0–120 (Supplementary Table 2). In forward stepwise linear regression with glycaemic load and dietary assignment as independent variables, only dietary assignment was associated with change in AUC Glucose0–120 (data not shown). None of the other effects, nor lack of effects, of group assignment on primary outcome variables (changes in weight, waist, AUC Glucose0–120 and AUC Insulin0–120) was essentially altered after adjustment for age or baseline levels of weight, waist, glucose, insulin, AUC Glucose0–120 or AUC Insulin0–120, nor after adjustment for intake (g/day or E%) of carbohydrate, protein, total fat, saturated fat, monounsaturated fat, polyunsaturated fat, fibre or sodium. Repeated-measures ANOVA gave similar results for primary and secondary outcome variables, and addition of baseline values as covariates confirmed the independent effect of Palaeolithic diet on improvement of glucose tolerance (data not shown). Serum lipids changed to a similar extent in both groups, due to initiation of statin treatment in most patients, and there was no decrease in blood pressure (data not shown). The impact of medication was not analysed. Among the 15 subjects who underwent BIA for body composition, change of fat mass did not differ between the groups (Table 7), and it explained 50% of weight change (p = 0.002). In this subset of patients, change in fat mass explained <l% of change in AUC Glucose0–120. We found marked improvement of glucose tolerance after advice to eat a Palaeolithic diet, based on lean meat, fish, fruits, vegetables, root vegetables, eggs and nuts as staple foods, while avoiding cereals, dairy products, refined fat, sugar and salt. Control subjects, who were advised to follow a Consensus (Mediterranean-like) diet based on whole grains, low-fat dairy products, fish, fruits and vegetables, did not significantly improve their glucose tolerance despite decreases in weight and waist circumference. The more pronounced improvement of glucose tolerance in the Palaeolithic group was unrelated to weight loss or decrease in waist circumference. In contrast, the insulin response changed more as a result of change in waist circumference than of dietary assignment or food choice. The higher drop-out rate in the Palaeolithic group (three vs none) does not appear to be an important source of bias. If we assume no change in primary outcome variables in any of the drop-out subjects, had they finished the trial, we would still have found larger decreases in AUC Glucose0–120 (p = 0.01) and 2 h glucose (p = 0.02) in the Palaeolithic group than in the Consensus group. It is conceivable, but not very likely, that the more pronounced improvement of glucose tolerance in the Palaeolithic group was due to higher motivation (rather than different food patterns). We were meticulous in our efforts not to give the subjects in the Consensus group a feeling of belonging to a control group. Thus, we told eligible persons that we were to compare two healthy diets, not knowing which was the better one. We informed all subjects individually of the presumed benefits of their respective diet (but not of those of the other diet) during two 1 h sessions, and all subjects were provided with recipes and written dietary advice of equal length. During the 12 week trial, waist circumference decreased more in the Palaeolithic group, but this did not explain the more pronounced decrease in fasting and post-prandial plasma glucose in these subjects. Among the whole study population, change in AUC Glucose0–120 was not related to changes in weight or waist circumference. Considering the large variation in weight loss (between −10.7 and +1.3 kg), and in light of earlier studies showing weight loss to be the major determinant of improved glucose tolerance , this lack of relationship is unexpected. In the Diabetes Prevention Project, weight loss was the dominant predictor of reduced diabetes incidence among glucose-intolerant subjects who were randomised to lifestyle modification . 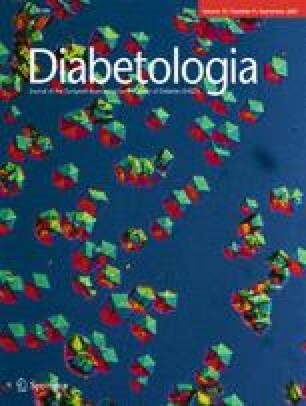 However, weight change does not explain all of the improvement in glucose tolerance in such trials, and in a meta-analysis on the efficacy of lifestyle education to prevent type 2 diabetes in high-risk individuals, four out of eight trials did not find any effect on 2 h plasma glucose despite significant weight loss . Furthermore, in epidemiological studies most of the variation in glucose tolerance among the general population is not explained by adiposity . Therefore, an improvement in glucose tolerance that is independent of weight change is not entirely unexpected. There was no apparent influence of dietary assignment on the HOMA-IR index of insulin sensitivity, and adjustment for changes in waist circumference or body weight eliminated the tendency towards larger decrease of AUC Insulin0–120 in the Palaeolithic group. This is in contrast to a recent feeding trial in pigs, where we found markedly lower insulin response by the frequently sampled IVGTT, independent of body weight, after 15 months of a cereal-free Palaeolithic diet, compared with a cereal-based swine feed . This discrepancy may be due to the use of frequently sampled IVGTT in the study in pigs, which gives a more precise measure of insulin sensitivity than that of the present study (HOMA-IR). Since we did not perform euglycaemic insulin clamp measurements, the gold standard for assessing whole-body insulin sensitivity, we may have missed a significant effect on insulin sensitivity. If not, our findings add to the evidence that reduction of waist circumference is more important than dietary composition for the treatment of insulin resistance . The very low reported energy intake in the Palaeolithic group, as calculated from 4 day weighed food records (registered early in the trial), does not necessarily imply under-reporting of food intake. An energy deficit of 4 MJ/day would be expected to cause a weight loss of 1 kg/week in the second and third months of energy restriction, and even more during the first month . Thus, assuming a pre-study energy intake of at least 10 MJ/day, the reported in-trial energy intake is actually higher than expected from the observed weight loss, even in the Palaeolithic group. In addition, the similar weight loss in the two groups is not incompatible with different energy intakes. In this context, the laws of thermodynamics need to be considered thoroughly. These laws state that energy is constant and cannot be destroyed. However, they also state that energy can take various forms, including heat, and that conversion from one form of energy to another is more or less efficient . Highly relevant, then, is the finding in animal experiments of decreased body temperature on low-calorie diets [42, 43]. Accordingly, identical weight loss on different energy intakes does not violate the laws of thermodynamics . It is important to separate glycaemic control, as measured by HbA1c, from glucose tolerance. A habitual diet which reduces the post-prandial glucose response, such as a low glycaemic load diet, can reduce the metabolic consequences of glucose intolerance, including delaying the manifestation of diabetes, without necessarily improving glucose tolerance itself [19, 44]. Although we cannot rule out glycaemic load as an important factor for glucose tolerance, our finding that the effect of Palaeolithic diet on glucose tolerance was independent of carbohydrate intake agrees with earlier studies which do not indicate a beneficial effect of carbohydrate restriction on glucose tolerance [20, 45, 46, 47]. The high fruit intake in the Palaeolithic group, almost sevenfold higher than the median intake among Swedish men (75 g/day) , and twice as high as in the Consensus group, should also be viewed against this background. Despite large variation in fruit intake (range 160–1,435 g/day in the Palaeolithic group and 53–679 g/day in the Consensus group), it was not associated with change in AUC Glucose0–120 (r = −0.02, p = 0.9) or AUC Insulin0–120 (r = −0.02, p = 0.9) and did not explain the effects of group assignment on these outcome variables. Furthermore, a high fruit intake was associated with larger waist loss. Thus, our study lends no support to the notion that fruit intake should be restricted in patients with diabetes or glucose intolerance. This is, to the best of our knowledge, the first controlled study of the effects of an ancestral human diet in patients with IGT or diabetes. In a non-controlled study of ten Australian Aborigines with diabetes and a mean BMI of 27 kg/m2, O’Dea et al. found that reversion to a hunter–gatherer lifestyle during 7 weeks led to 10% weight loss and reductions in fasting and 2 h glucose of 45 and 36% (p < 0.0001 for all) . Fasting insulin decreased by 48% (p < 0.0001), while 2 h insulin did not change (+20%, not significant). Both diet and physical activity changed markedly, which precludes evaluation about the isolated role of diet. In contrast, in a similar study on healthy Australian Aborigines by the same authors, the insulin response to 70 g of starch from white bread (and butter) was reduced, while the glucose response was not, after 10–12 weeks of reversion to a traditional lifestyle . In conclusion, we found marked improvement of glucose tolerance in IHD patients with increased blood glucose or diabetes after advice to follow a Palaeolithic diet compared with a healthy Western diet. The larger improvement of glucose tolerance in the Palaeolithic group was independent of energy intake and macronutrient composition, which suggests that avoiding Western foods is more important than counting calories, fat, carbohydrate or protein. The study adds to the notion that healthy diets based on whole-grain cereals and low-fat dairy products are only the second best choice in the prevention and treatment of type 2 diabetes. The study was funded by Region Skåne and Lund University.